Spray 13x9-inch (3-quart) glass baking dish with cooking spray. In 12-inch skillet, cook sausage over medium heat 5 to 7 minutes, stirring occasionally, until sausage begins to brown; drain if necessary. Add onion; cook 2 to 3 minutes or until slightly softened. Add both bell peppers; cook and stir 1 minute. Add garlic; cook and stir 30 seconds or until softened. Spread half of potatoes in bottom of baking dish. Sprinkle with 1/4 teaspoon each of the salt and pepper. 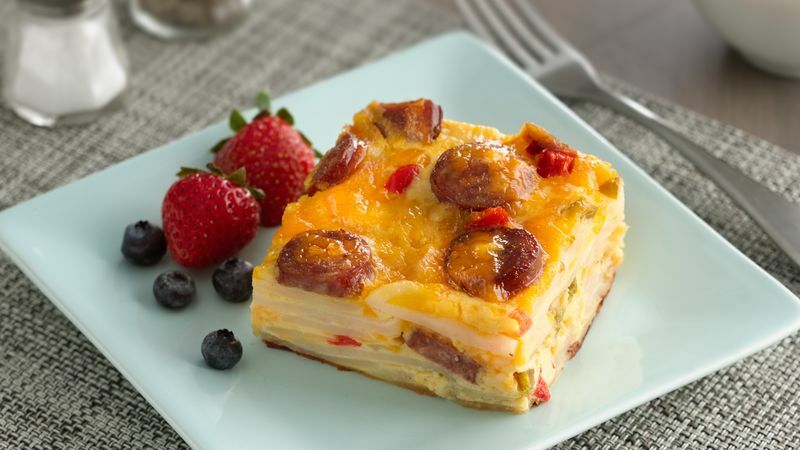 Layer with half of sausage mixture and half of cheese. Repeat layers. In large bowl, beat eggs and milk with wire whisk. Pour over layers in baking dish. Cover; refrigerate 8 hours or overnight but no longer than 24 hours. Heat oven to 350°F. Loosely cover baking dish with sheet of nonstick foil or regular foil sprayed with cooking spray (nonstick or sprayed side down). Bake 1 hour 30 minutes to 1 hour 40 minutes or until set and potatoes are tender when pierced with a fork. Remove from oven; let stand 5 minutes before cutting. Pair this do-ahead egg bake with a do-ahead side—a simple fruit salad, tossed in citrus juice for freshness. If you prefer less heat, use Italian sausage instead of the spicier options.